Celebratory weekends and unique events ensure that modern weddings are as memorable for the guests as they are for the happy couple. Competitive fishing, white-water rafting and cooking classes may sound more appropriate for a vacation itinerary than a wedding weekend checklist, but couples today are embracing especially memorable get-togethers that allow them to spend extra time with loved ones before the main event. Suzanne Reinhard of Suzanne Reinhard Events has found that many traditional weddings are essentially becoming destination affairs since a significant number of the attendees live out of town. With busy friends and family scattered across the country, savvy brides and grooms have recognized that the gatherings surrounding the nuptials are ideal for catching up and having fun with the most important people in their lives. Unique events—and more of them—allow the couple to make the most of having their nearest and dearest all in one location. Lindsay Sims of Atlanta-based TOAST Events has seen an increase in additional marriage-related events among her clients as well. Particularly for a wedding with a large guest list, more weekend gatherings give the bride and groom the chance to interact with everyone. A single night of celebration simply isn’t enough time to spend with their favorite people when they’re all gathered in one place. A plethora of trending new options ensure that the wedding weekend will be as memorable for the guests as it is for the happy couple. “The rehearsal dinner and farewell brunch are pretty typical, but now we’re starting to see a lot of families start the weekend with a Thursday night dinner,” Reinhard explains. This kickoff to the wedding weekend allows the family and guests who live near the ceremony location, or who arrived early, the chance to start the celebration on a more casual note than most rehearsal dinners. They can also serve as an opportunity for another member of the family to become more involved in the process. With the multitude of family configurations that abound, there are often more than four parents involved, not to mention grandparents and other very close relationships. Additional events give other important figures the opportunity to celebrate the bride and groom as hosts. “Thursday night dinners are becoming much more planned out and intentional,” Reinhard says. Most are still held at restaurants or event venues, but Reinhard has also found some are hosted by family members at their homes. Killgallon frequently sees welcome dinners at Sea Island as well, either in a traditional restaurant atmosphere or a more unique outdoor venue like Rainbow Island, a scenic marshfront setting with a rustic feel. While Thursday night dinners act as a prequel to the rehearsal, Reinhard says that many fun-loving couples are also adding an event afterward: the rehearsal dinner after-party. Some guests would have naturally continued the revelry as a group, but a planned bash pulls everyone together and puts the bride and groom front and center in the festivities. Like the Thursday and rehearsal dinners, couples are now embracing many other coed events, particularly when they share a group of close-knit friends. “I think a lot of couples meet in college and have a lot of crossover friends,” Sims explains. In some cases, even traditionally separate events are now being combined. “There’s definitely been a trend in coed showers and coed bachelor/bachelorette parties, where the whole group goes to Vegas together to celebrate,” Sims says. 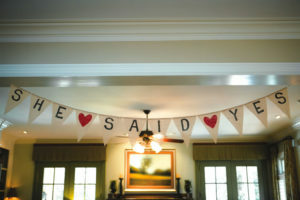 Couples showers are another fun way for the entire bridal party to spend time together, and can certainly get more creative than cocktails and hors d’oeuvres. Sims finds that coed showers often center around the kitchen or bar. Think a “stock the bar” party, or similar theme. “One couple loved brunch, that was their thing, and they had a fancy brunch coed shower,” she says. 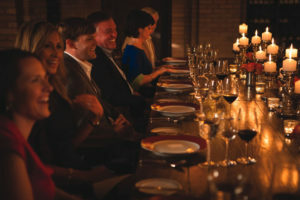 Wine tasting in Sea Island’s wine cellar is one option for an experience-driven event. With many traditional events already planned for the wedding weekend, Reinhard finds that the bride and her closest family and attendants are more likely to have their experience-driven gatherings occur beforehand. She recalls an adventure-loving bride with outdoorsy friends who went to Colorado and spent a celebratory weekend white-water rafting with her girlfriends in lieu of a typical bachelorette party. The groom and groomsmen, on the other hand, are often able to fit things in on the morning of the wedding, both Reinhard and Sims say. Golf, Reinhard says, used to be the typical way the men would spend their morning, but is now far from the only option. While golf at the resort is spectacular, Killgallon recommends a fishing adventure for grooms looking for something a little different. 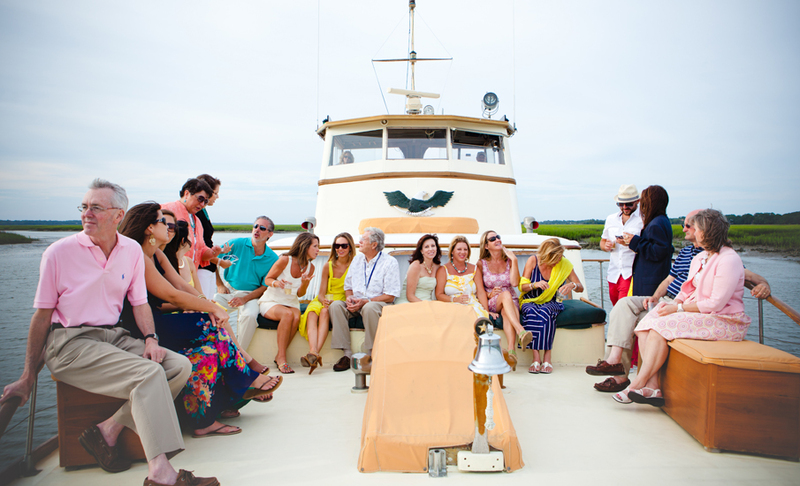 “Our captains love to take groomsmen parties fishing—both inshore and offshore,” she says. Checking out exotic cars at a driving track or gathering for a competition at a shooting club are other ways that the guys can bond and blow off any nervous energy that they’re feeling before the wedding. But whether the competition is in golf, fishing or shooting, Killgallon has seen a change in the past few years—it’s no longer a given that the groom’s friends will let him win. Sims agrees that most grooms and groomsmen enjoy setting aside some time for a calming hot shave or other treatment. Sea Island is well-prepared for such events. “Our Men’s Locker Room is the ultimate man cave,” Killgallon explains. With lunch service, a full bar, cigar room, cushy oversized armchairs and flat-screen TVs, it’s easy to see why the groomsmen would enjoy unwinding there together before the wedding. Brides are also finding new ways to bond with their parties on the big day, as beauty traditions are being updated to become more lively and make the most of the ladies’ time together. At Sea Island, groups can enjoy sparkling wine cocktails—peach puree and prosecco—while getting a pedicure. For those looking for a little more activity to do together, she recommends a private yoga class on the beach. “It’s amazing that we can fit so much into a weekend,” Reinhard says. While the wedding day is a celebration of the bride and groom, unique additional events allow everyone to have an enjoyable time together, creating new memories on a special day.